A Catalpa tree will grow quickly and can reach heights of up to 80 feet. The average and expected height of most Catalpas will be around fifty feet. This tree grows the quickest during its first ten years, reaching about twenty feet tall before it slows down. The Catalpa is a deciduous tree whose varieties can grow nearly everywhere in the United States. Visually, and feature-wise, you'll notice its blooming white flowers in the spring. Creating a unique look not seen on many trees. Especially not on trees that can grow as large as the Catalpa. Also, later in the season, you'll see the development of its seed pods. When autumn comes, the leaves of the tree will turn brown and fall off once the first heavy frost occurs. Along with its seed pods. 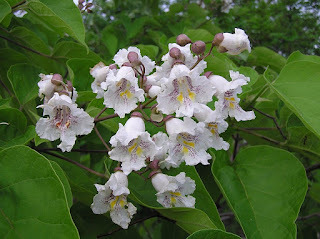 Some consider the Catalpa tree, with its flowers, to be an ornamental tree. Its white flowers certainly do grab your attention. whooping cough and malaria. The flowers have been used as a treatment for asthma or as a light sedative. Its pods have also been used as a light sedative. Lastly, the leaves were used as a poultice for wounds. 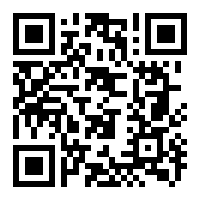 Though it's not recommended you use it for any of these purposes unless you know what you're doing. 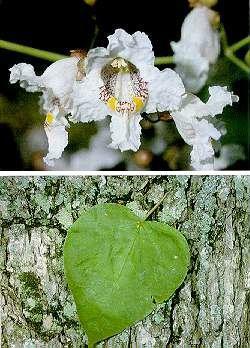 The most common species of the Catalpa tree are the Chinese Catalpa , the Northern Catalpa, and the Southern Catalpa. The Catalpa tree also goes by the Indian bean tree, the cigar tree, and (historically) the Catawba.